Wrath of the Ninja - the Yotoden Movie is one of those classic anime that is quickly sinking into obscurity. 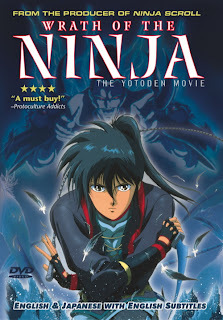 Not quite as detailed or bloody as Ninja Scroll, not as political as Rurouni Kenshin and not nearly as silly as Naruto, this movie still strikes hard at any classic anime fan’s heart like a spring-loaded dagger. To make this review more interesting, we’re going to turn it into a drinking game. Every time I mention a cliché in this movie’s plot, I want you all to take a drink from whatever you’ve got. The Japanese Middle Ages: Our hero is a determined and level-headed young ninja woman named Ayame, the sole survivor of her village. Before the demons could consume her, her brother (in a drawn-out and much-repeated flashback) gives her the village’s super-awesome short sword with which she may rid the world of evil and stop the evil lord Nobunaga Oda from taking over the world. Along her merry way, she gains two friends, other rogue ninja who also possess legendary weapons: a spear and a long sword. They travel, smiting evil until it comes down to Ayame and Oda (now transformed into something that would make Inuyasha’s Naraku retch) and, Ayame, having screamed the loudest, blows Oda apart in a big bright explosion, thus bringing the ending credits to the screen. Though it is a little unfair to review Wrath of the Ninja without the three-episode OVA Yotoden that it was compiled from, WotN is still a pretty solid example of fantasy ninja action from the days before chakra was introduced. The retro blurred backgrounds, mysterious supporting characters and destiny-babble do not subtract from the charm of this classic. What can really grind your nerves about this movie is the absence of originality; this is a great anime if you want to parody the stuff you've already seen. Granted, the pacing, odd jumps in time, and emotional distance of the main characters make this a hard one to watch with friends; rather than watching the screen, you may find yourself looking at your watch instead.